I was born in Prague, Czech Republic in 1975. Since my early childhood I was fascinated by wolves, dogs horses, cats and wild animals. At six I dreamed of becoming a vet one day, but when the decidion to chose further studies came I hesitated between a six year study far from home and mushing and breeding of my first huskies. The dogs won. In 1990 I became a happy owner (or became owned!) of my first siberian husky – beautiful white, brown-eyed boy FORD from Jirina and Ota Jancar's kennel Z ÚVALÁKU. It was a novice's luck that Ford's temperament and great working abilities made him my best leader of 6, 8 and 10 dog teams. The Jancars' advises and their enthusiastic talks about the breed along with advantures made with Ford made me a total „husky adict“. During next year I brought home another boy - KIPP (Lustvisihak z Uvalaku) and ADELAIDE (Adelaide od Pulnocniho slunce – our kennel's foundation female). In 1992 I had the oportunity to spend a year in Canada, studiing on a high school in Oaksbank, Manitoba and living with Vince and Lori Boileau and their 10 siberian huskies. I helped with all activities in their METALIKA KENNELS (show and recreational mushing oriented). I learned how to take care of a pack of dogs, to raise puppies, Vince taught me how to handle dogs properly at dog shows and, of course what it is to mush dogs in temperatures way below zero (-30C celsia and less). The many mushing trips and adventures I was able to make with their dogs gave me many lessons I could not gain in central european climate: How to trust a lead dog in a whiteout, how to camp out in the arctic climate, etc. 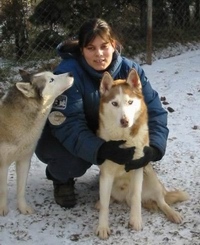 From Metalika kennels I brought home two puppies – Metalika's Tuktoyaktuk of Kipp (who later became an important stud dog in the czech siberian husky breeding) and Metalika's Polar Princess (red pinto – very uncomon color in Europe). During my stay in Canada I had an access to important information from the world of siberian husky – so dificult to get in our country until today – and especially to information on breeding lines and contacts to experienced siberian husky breeders. In 1993 KIPP D'AMUNDSEN KENNELS were established with a great help of my dad – Vladimir. The kennel name is a tribute to one of my first huskies – Kipp who tragically died (he was shot because „he looked like a wolf“), as well as to norwegian antarctic explorer Roald Amundsen, who was able to reach the South pole and safely return only thank to a team of sled dogs. In March of '93 my great dream became true – I stood on the 4th avenue in Anchorage and saw the start of Iditarod Sled Dog Race – the greatest race on Earth, leading across Alaska from Anchorage to Nome. 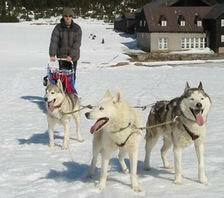 Afrer my return from Canada I went on to train, race, breed, show – and live with siberian huskies. In the first years I got recived some advice and experience from Ivan and Maika Sibrt – who's ZE SIBRTU kennels were top racing siberian husky kennel in central Europe and most of Czech working siberians come from their bloodline, who invited me and my dad to train with them. The Síbrts raced in Pirena very sucessfully. The puppies we bred grew into strong, endurant dogs and also gained some titles in the show ring: class winner, club specialty winner, CAC, CACIB, BOB. Two of my 10 dog team's members became sucessfull stud dogs and Kodiak (CH. Metalika's Polar Bear) is not only a member of our sprint, mid distance and stage race winning team, but also a very sucessful show dog. He is the only pinto siberian husky to gain a BOB and championship title in the history of the breed in the Czech republic, as (unfortunattley) the white siberians are, for some reason, not popular in the Czech show ring. After almost 13 years of experience my decision for future became obvious: I decided to breed the so called „original siberian“ -- atractive, friendly, easy to handle working dog, beautiful in all existing colors, the siberian as described by his breed stanadard, and present him to the public, which is, in these days , not only in my country little bit desinformed about this beautiful multipurpose working dog and his real nature. ... success of breeders in other parts of the world shows that it is possible, so it must be possible here too! A split of siberian husky was created years ago all around the world. The „orginial“ siberian husky was split into two different lines: working and show. Here, in Europe the gap has become more obvious over the past decade. While extreme show type siberians lose on temperament, angulation, lenght of legs and many other atributes that make siberian husky an excellent working dog with great „drive“, some extreme types bred for race purposes do not longer look like siberian husky as well. These extremes have often very untypical head and ears and sometimes exceed the standard hight (size). After years of experience, evaluating historical photographs and pedigrees, visiting top breeders all around USA, Canada Germany, Finland, etc. I found out that neither one is the right way. 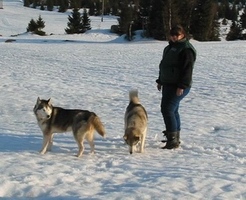 After visiting Earl and Natalie Noris' ALASKAN ANADYR KENNELS (1996) I was sure that there is a way how to breed „good-standard looking“ and temperament, hard working siberians within one kennel. Their 150 siberian huskies of all possible colors one can imagine are sure typical representatives of the breed and at the same time very competitive racers. (The Alaskan Anadyr Iditarod team sets the overall record of the breed on the Iditarod trail). More and more often we hear about the success of „good looking“ siberians in races and about „working type huskies“ winning dog shows and that's a great news to all of us – siberian husky breeders, who chose the way of „resurrection“ . It sure is a great motivation for us! On this website I would like to share experiences, information and news from the world of siberian husky with all those, who have the desire to find out more about this outstanding breed of dog. 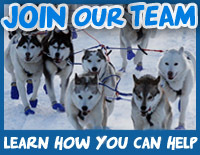 To learn more about our kennels, our goals and philosophy, please visit the ABOUT US page. To meet our dogs, please see their presentation here.